Own Tweenies - Colours Are Magic DVD from Deff, DVD, Blu-Ray & 4K Video Specialists - Free UK Delivery..
Do you like to make music? Well the Tweenies love to! In each of these four fantastic episodes they explore a different section of the orchestra. First they learn all about percussion instruments which are Milo's favourite, he becomes a one-man band and plays them all together! Then they find out about the strings which Fizz loves, and have great fun acting out Old King Cole. 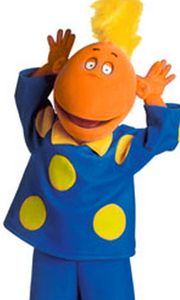 Next it's the turn of the brass section, and Bella dreams of ..
Own Tweenies - Night - Time Magic DVD from Deff, DVD, Blu-Ray & 4K Video Specialists - Free UK Delivery..
Ready To Play: Get ready to play with the Tweenies. You will learn something too! Milo feels like being very noisy so Max shows the Tweenies how to make musical instruments. Jake discovers he is too small to play ball - but he Is the best at hiding and he Is getting bigger every day. Bella breaks a marionette, and learns the importance of telling the truth. Fizz trains the others to perform in a very funny ballet. Song Time: Twenty-thr..